Municipal Solid Waste (MSW) is mainly generated by households. This waste has been filled in municipal landfill areas for a long time. In recent times, MSW is considered as a resource by recycling certain portions or through recovery operations such as energy conversion and composting. In general, MSW contains textile, paper/cardboard, plastics, and organic matter. Chemical characterization of waste to find out any harmful constituents is critical for determining the processing method. Additionally, when incineration is considered, ash-forming elements as well as any corrosive elements (Cl and S) are of interest. Energy-Dispersive X-Ray Fluorescence (EDXRF) is a cost-effective instrumental method for determining all elements of interest at concentrations of a few ppm to % w/w. The ARL QUANT’X™ XRF Spectrometer from Thermo Scientific™ is an EDXRF system that offers an economical and quick analytical capability. It is equipped with an air-cooled Rh end-window tube with thin Be window of 0.05 mm thick and has the highest power of 50 Watts. An electrically cooled silicon drift detector (SDD) with an area of 30 mm2 is equipped in the ARL QUANT’X Spectrometer. In total, nine primary beam filters are provided in the instrument guaranteeing an optimal excitation condition is always found. Unattended analysis is enabled by an optional 10 position sample changer. Since MSW is an inhomogeneous material, its composition changes considerably and sampling remains the major source of error. Sample preparation for XRF analysis is equally essential for obtaining reliable results. The sample is ground using a cutting mill to obtain a homogenous sample with particle fineness of 0.25–4.0 mm. A particle size of less than or equal to 500 μm is enough for the determination of medium to heavy elements. Further grinding of lighter elements, using a rotor mill, might be required for particle sizes down to 50 μm. After being ground, the sample is combined with a binding agent and pressed into a pellet. With access to a representative set of standards, outstanding results can be achieved using an empirical calibration associating characteristic peak intensity to concentration probably combined with Compton correction to adjust for variances of the sample matrix. A set of well-characterized standards is usually difficult to obtain depending on the range of the waste received. The Thermo Scientific™ UniQuant™ Software for EDXRF is the proprietary standard-less FP-based software that provides excellent quantitative results and needs only a few standards to set up the calibration. In EDXRF, precision and sensitivity are realized by targeted excitation of the sample to fluoresce only the elements of interest. The ARL QUANT’X EDXRF Spectrometer provides a broad array of excitation voltages (4–50 kV) and several primary beam filters for optimal background control. As illustrated in Table 1, eight spectra are collected for each waste sample for a total live time of 7 minutes, corresponding to less than 15 minutes real time for each sample (including detector dead time). If the type of MSW under analysis is well characterized and possibly includes a mixture of textile, paper, plastics, and organic matter, UniQuant Software can be simply calibrated using a set of cellulose and polymer standards. For this purpose, various polymer standards as well as cellulose samples doped with heavy elements at different concentrations are used. Using both the ARL QUANT’X Spectrometer combined with UniQuant Software as well as ICP-OES, various MSW samples have been assessed for validating the technique. MSW samples were ground down to the particle size of 500 μm using a Retsch SM200 cutting mill. The resulting powder was divided into two portions. One portion was used to press samples using a wax binding agent and evaluated with the ARL QUANT’X Spectrometer. The remaining portion was evaluated with ICP-OES. 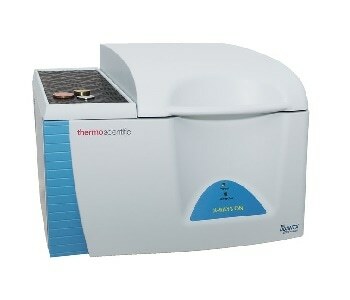 Preparation of sample for the ICP-OES includes digestion using an HF:HNO3:HCl solution. The results obtained for one of the MSW samples are compared in Table 2. The relative difference is found to be less than 30% for all elements. It can be said that it is possible to achieve an excellent agreement between EDXRF and ICP results. Table 2. Analysis results for a typical MSW sample, obtained by EDXRF and ICP-OES. Excellent agreement is found considering the type of material that was analyzed. The Method Detection Limits (MDLs) that can be expected for the ARL QUANT’X EDXRF Spectrometer are shown in Table 3. Table 3. Typical Method Detection Limits (MDL) obtainable for the ARL QUANT’X Spectrometer when analyzing MSW samples. Despite the fact that MDLs might differ depending on the presence of elements and matrix, Table 2 shows that the MDLs enable rapid screening of MSW to detect any harmful constituents. This article demonstrates the possibility of using the ARL QUANT’X EDXRF Spectrometer as an economical solution to screen Municipal Solid Waste (MSW) samples for determining the presence of any harmful substances. Despite limiting the sample preparation to a minimum, the method enables the detection of all elements of interest.